The theatricality implied in the exhibition’s title is most literally represented in photographs by Karen Miranda Rivadeneira and Rachelle Mozman. Mozman, who divides her time between Brooklyn and Panama, photographs her mother and herself as characters exploring their shared family history. She describes her work as “the intersection of documentary, narration and performance,” but it is also reminiscent of telenovelas. In one image, Mozman’s explores class and race as her mother plays three roles, two sisters—one light-skinned, one darker—and a maid. Rivadeneira, a New Yorker from an Ecuadorian family and now living in San Francisco, stages photographs of moments in her family’s past that may not have been recorded and recreates them from memory, inserting her adult self into them. Handwritten captions and dates turn the photographs into a diary, and show how traditions are passed on from one generation to the next. Carlee Fernandez and María Martínez-Cañas are also represented in the exhibition by photographs, although both identify as sculptors. Los Angeles-based Fernandez is showing two series of photographs. In Bear Studies, she explores the relationship between humans and nature by photographing herself wearing portions of a taxidermied bearskin; in The Strand that Holds Us Together, she also explores gender issues by inserting herself in images of beasts and of famous men she admires. In one image, Fernandez photographs her own hand next to another person’s; only on close examination does the viewer realize that two distinct people are represented. Her explorations of self-identity and family are most clearly expressed in the pairing of a photograph of her father with one of herself, dressed and posed alike. The quest to ground identity in one’s parent is also a central theme in a series of photographs by Martînez-Cañas, who was born in Cuba and now lives in Miami. In Duplicity as Identity, she overlays images of herself on ones of her father at the same age, progressively ranging from 90 percent him and 10 percent her to the reverse ratio. At each end of the series, the similarities in facial structure and appearance between her and her father are startling and raise questions of continuity and individuality within the family. In stark contrast to those subtle and contemplative photographs, are bold paintings by Michael Vasquez and David Antonio Cruz. Vasquez, who now lives in Miami, paints large-scale, almost confrontational images of gang members he knew growing up in Saint Petersburg. He portrays them from his perspective of a boy growing up without a father figure. His paintings reflect both the allure of the gang as a surrogate family and the conflicting emotions of alienation. Cruz’s equally forceful canvases map out stories he says have been omitted from the narrative of Puerto Rican immigration. The china, costumes, rags and gold-leaf that he affixes to his canvases both stage and obscure what Cruz calls “the queer body.” Lavish flows of chocolate paint are a symbolic reminder that “brownness” is often invisible in the American racial binary. The artists in this Smithsonian exhibition employ different mediums, draw on diverse geographies and relate individualized stories. Taken together, however, they underscore Caragol’s observation that the National Portrait Gallery is “as much about history as it is about art.” With that dual goal, one of her next exhibitions will spotlight Dolores Huerta, the labor leader and civil rights activist, who co-founded with César Chávez what would become the United Farm Workers. Caragol is also acquiring works by Latino artists to add to the National Portrait Gallery’s permanent collection. 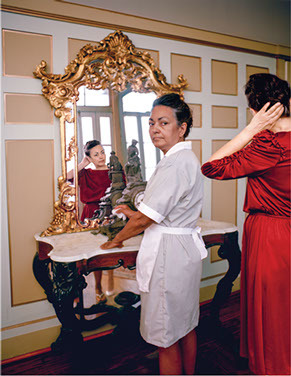 Portraiture Now: Staging the Self continues on display in Washington, D.C. until April 12, 2015, after which it will travel to the Americas Society in New York City and the National Hispanic Cultural Center in Albuquerque, NM.